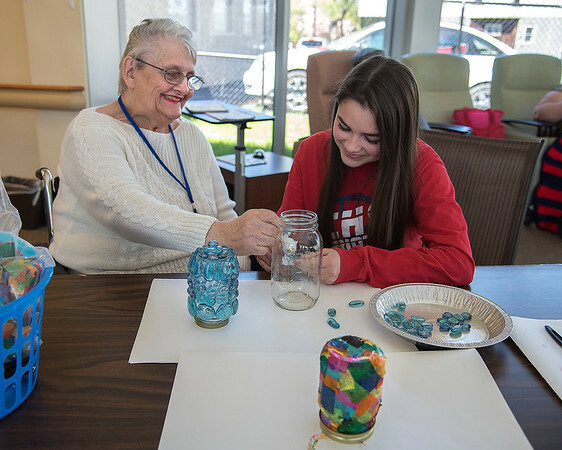 Niagara Falls, NY - Patricia Nachreiner of North Tonawanda works on an art project with Niagara Catholic 10th grader Mikayla Dacosta, 15, at the Health System of Niagara County Inc., (HANCI) offices on Main Street. Students, faculty, and staff of Niagara Catholic Jr. / Sr. High School volunteered throughout Niagara County as part of their annual “Day of Caring”. One week from today, Tuesday, May 9, 2017 students, faculty, and staff of Niagara Catholic Jr. / Sr. High School will volunteer throughout Niagara County as part of their annual “Day of Caring”. With almost 200 volunteers, the Niagara Catholic family will participate in activities at 18 sites throughout the area. Students will perform tasks such as gardening, cleaning, organizing food pantries, running Bingo Programs at Senior Centers, and working with Pre-K students. This day offers students in grades 7 through 12 an opportunity to experience the various needs of others throughout the community that transcends culture, age, or socio-economic backgrounds. It introduces students to the importance of service and allows them to feel the inner joy that comes from helping others.